Groundhog Day is right around the corner. I live only a few mere hours away from the day’s big guy – Punxsutawney Phil! In celebration of the hope that Phil will emerge from his home in Gobbler’s Knob and not see his shadow (meaning an early spring), we’re making groundhog shadow puppets. These aren’t the traditional shadow puppets. 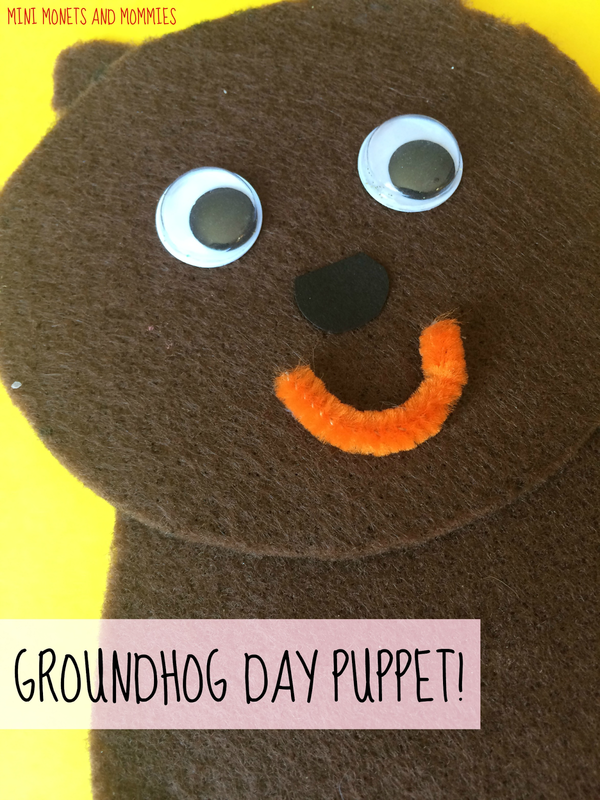 Your child can use it as a regular animal stick puppet for hours of pretend play after (or before) she heads outside to see if her ‘Phil’ sees his shadow or not. · Groundhogs typically weigh 12 to 15 pounds and are 20 inches long as adults. According to the Punxsutawney Groundhog Club, Phil weighs 20 pounds and is 22 inches long. He’s a big whistle-pig, isn’t he? · They are usually found in the northeastern and northcentral U.S., along with Canada and Alaska. · Usually solitary animals, they will stay with their young for a few months. That said, the family of groundhogs living in my backyard stayed together for at least two years (we moved after that, so I don’t know what happened to them. Especially because the not-so-whistle-pig-loving people who bought our house filled in all of the burrow holes, according to the neighbors). · They live in burrows, where they will hibernate for the winter. They also dig escape tunnels and holes. · Groundhogs are rodents of the species marmot. They are part of the squirrel family, according to National Geographic. · Even though they have the word “ground” in their name, these animals can climb and swim! 1. Draw one oval and one circle onto the cardboard. The bigger your child draws them, the bigger the puppet. This is a great opportunity to talk about shapes – adding in a mini-lesson on math and geometry. 2. Cut the shapes out. 3. Place the shapes onto the felt. Trace around them. 4. Cut the felt out. 5. Glue the felt to the cardboard. 6. Assemble the groundhog. Glue the circle head onto the oval body. 7. Cut two semi-circles out of the leftover felt to make ears. Have your child glue these to the top of the head. 8. Add a face to the puppet. Cut out an oval or semi-circle out of the black paper to make a nose. Glue this, along with two googley eyes to the circle face. 9. Give Phil a smile. Cut an inch or two from a pipe cleaner. Have your child curve it to make a mouth. Glue it to the face. 10. Turn the puppet over (after the glue has dried), and tape a rectangle-shaped piece of cardboard to the back. Your child can also use a thick craft stick. After the puppet-making is complete, take Phil outside. Have your child hold him in the sunlight and look for his shadow on the ground. When you go back inside write whether or not the groundhog saw his shadow on the handle. 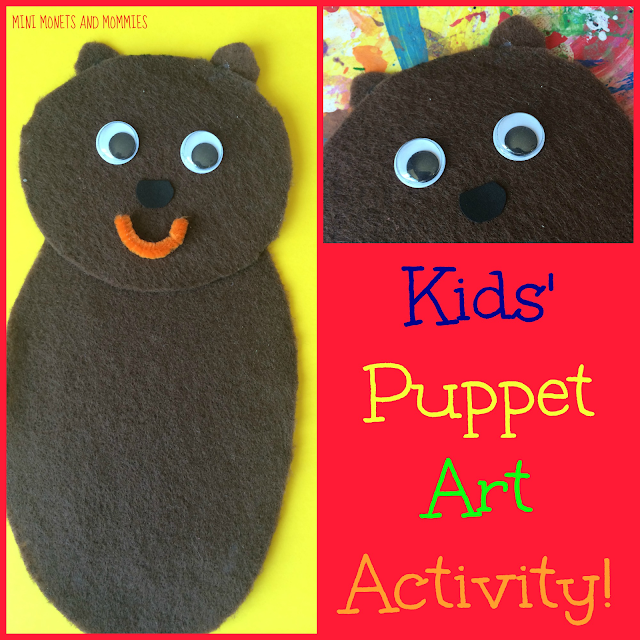 Are you looking for more winter themed kids' activities? Follow my Pinterest board for ideas! Follow Mini Monets and Mommies's board Winter Activities for Kids on Pinterest. cute puppet and love the fun facts! Thanks for sharing at our share day today! I'm totally going to make this - cute! Thanks! They are so much fun to make - and use (hopefully Phil says winter will be over early)! 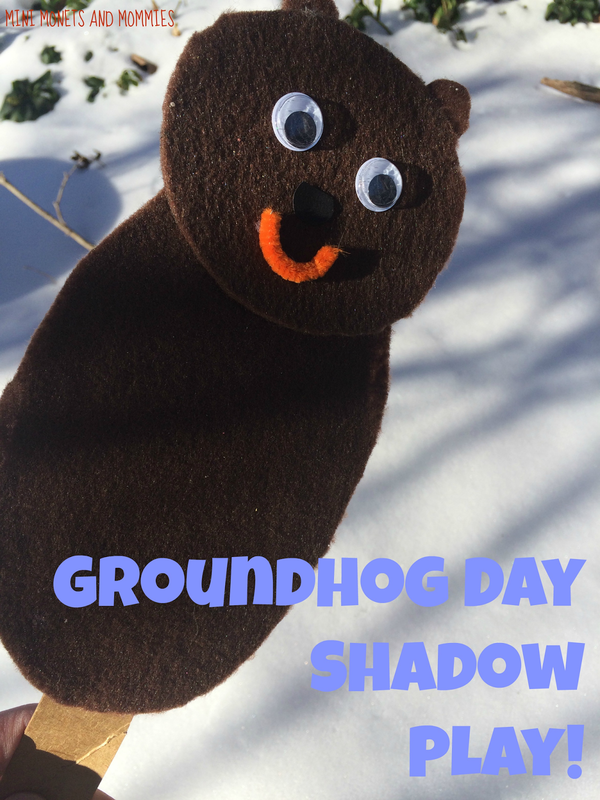 This is a really cute idea for Groundhog Day! Finger Paint Valentine's Day Art, with Clay! Winter Collage Art for Kids: Impressionist Style!